I haven’t made any cupcakes in a long time so after I had bought some new cupcake cases I wanted to try them out to make sure they don’t peel back when you back them and let them cool. If you don’t know what I mean, have you ever had it where you bake loads of lovely cupcakes and as they are cooling the wrapper starts to peel off! It is so annoying because it looks like someone has been unwrapping your cakes ready to eat them and all you can do is stare at them looking back at you really sad and uninviting? Well, if you haven’t then you’ve been very lucky. Well, I wanted to make sure these didn’t peel as I need them for a very special occasion – which I’ll write about soon. Usually when I fancy cupcakes I always think of lemon but this time I was raiding my kitchen cupboards and came across some tiramisu flavoured drinking chocolate from Italy, so I thought that sounded like a good combination. 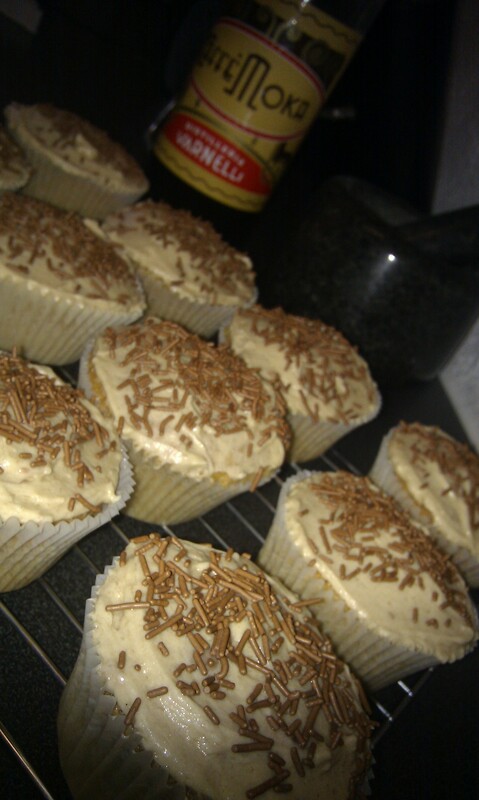 I added a little café Moka Varnelli into the mix to give it some more taste and voila… Tiramisu cupcakes! Obviously these aren’t anywhere close to a real Tiramisu – which is one of my favourite birthday cakes I used to get, but the flavour is there. There is no coffee in this, or alcohol, or raw egg whites so are suitable for anyone who can’t have these. However, if you can’t get hold some of the ingredient then make your own flavouring using a little good quality brewed coffee left to cool, with brown sugar dissolved into it (or use coffee essence) and use normal drinking chocolate instead of the Tiramisu flavour. This recipe will make 12 large cupcakes or 18 standard sized. For large cupcakes bake for approx. 25-30 minutes, for standard cupcakes bake for 20 minutes. Margarine, icing sugar, tiramisu flavour drinking chocolate and Café Moka Varnelli. Cream together the margarine and sugar in a bowl till they start to pale and look fluffy. Weigh out the flour and drinking chocolate together in the same bowl. Crack in one egg and add two tablespoons of the flour and drinking chocolate mix then combine together. Once they come together do the same again with the other two eggs and flour. Finally add the last bit of flour making sure you don’t overwork the mix through this process. Spoon this mixture into the cake cases until they are 2/3rds full and bake in the oven for the recommended time. Make sure you don’t open the oven till 20 minutes have gone by otherwise you risk the cakes collapsing. Test they are done by poking them gently with your finger, if they spring back then they are ready. Whilst the cakes are cooling make your butter cream icing for the top. You don’t have to be accurate with this as it is all a feeling of texture and taste. Put a large spoon of margarine into a bowl and mix it with a spoon a little till it becomes soft, then combine a small dash of Café Moka Varnelli. Add a large quantity of icing sugar mixed with some Tiramisu drinking chocolate into the soft margarine. Slowly and carefully, so not to make a mess of you and your kitchen, mix together. If you need to or want to – add more icing sugar. You will know it is perfect when it tastes really nice and sweet, feels very fluffy and is a little stiffer.